>A bead of high-purity arc-melted osmium. Osmium (Os) is a hard, silver-gray element in the platinum group; also a transition element. Discovered by Smithson Tennant in London in 1803, osmium is the densest of the elements (twice as dense as lead) and as rare as gold; the chief source is a by-product of smelting nickel. It is slowly oxidized in air. The most common isotope is 192Os (41.0%). 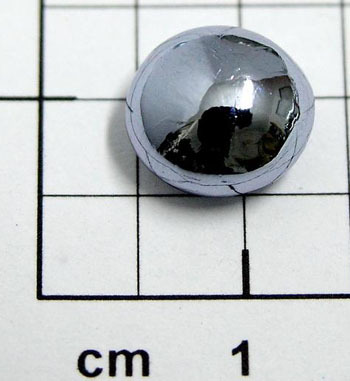 Like iridium, osmium is used in producing hard alloys. It is also used to make electrical contacts and pen points. Osmium tetroxide is a colorless or faintly yellowish compound used to stain fats or as a fixative in the preparation of tissues for study by microscope. Osmium tetroxide evaporates readily, the vapor having a toxic action on the eyes, skin, and respiratory tract.